Built in the 1390s, Boston Guildhall in Boston, Lincolnshire is a testament to the wealth and influence of the Guild of St. Mary, at a time when Boston's power as a centre of trade was second only to London. This wonderfully preserved building, with a wealth of original features, has survived the centuries and is to be enjoyed as one of Boston's finest visitor attractions. 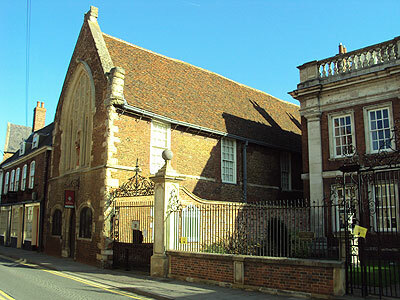 A wealth of stories, secrets and experiences are told and shared throughout the building including the history of the Guild of St Mary, international trade with the Hanseatic League, Henry VIII dissolve of the Guild, the foundation of the Corporation of Boston and the very famous trial and imprisonment of the Pilgrim Fathers. The Guildhall is also home to the town’s museum collection where displays and exhibitions bring life to the stories told. St. Mary's Guild, which built the Guildhall, became the richest and most prominent of Boston's Guilds and its members included many of the town’s merchants and traders at a time when the town itself was enjoying great prosperity. Guilds like those of St. Mary's were fundamentally religious in inspiration. It was accepted that life is but a passing phase and that Man's true destiny lies in the world to come. One of the Guild's foremost purposes was therefore to provide masses for the souls of their deceased members. The reply to the King's writ of enquiry of 1389 states that St. Mary's Guild was founded in 1260 by Andrew de Gote, Walter Tumby, Galfried de la Gotere, Robert Leland and Hugh Spayne. Its objectives included the maintaining of two priests in the parish church to say masses for the benefit of all members living and dead, to burn wax candles before the altar of the Blessed Virgin and to bear torches at the funerals of Guild members. A thousand loaves and a thousand herrings were to be distributed annually amongst the poor of the town. St. Mary's was open to anyone, male or female, who was prepared to take the strict oaths of admission and pay an initial fee of 6s 8d and an annual subscription of 1s. St Mary's Guild was incorporated in 1392 by licence from the Crown and this enabled it to hold land and property in perpetuity. During the medieval period most people were illiterate and relied on the clergy to interpret the word of God and tell them how to obtain salvation. Guarantees of such salvation came to be linked to bequests of money, land and property. Numerous gifts were made to St. Mary's. Thus for example, in 1393 Margaret Tilney gave a house and land on the east of the river and in 1447 Richard Benyon and others gave five dwellings, thirty-one acres of land and ten acres of pasture in Boston and Skirbeck. The increasing popularity of the Guild not only encouraged many such gifts but grew further as a result of indulgences that it was able to secure in the 15th and early 16th Centuries from respective Popes. These ranged from 100 days remission from penance for all guild members who were present whenever mass was celebrated aloud, with music, in the chapel in St. Botolph's at Easter, Whitsun, etc. (granted in 1506). These indulgences clearly made the Guild more attractive to would-be members. By the beginning of the 16th Century St. Mary's Guild was both influential and prosperous and counted many of the town's most important citizens amongst its members. During the 1520s it even achieved a measure of national fame through the choir it supported at St. Botolph's and its connection with John Taverner. Taverner, a well-known composer, came to Boston late in his life and there is a memorial stone to him under the tower of the parish church. By now the Guild had apparently also acquired many sacred relics and miraculous objects including the finger of St. Anne set in a hand of silver and gold, a silver and gilt case containing a part of the stone of Calvary, and even a silver and gilt case, surmounted by an image of the Virgin and Child, which contained some of the milk of Our Lady! Needless to say, such powerful relics and objects made the Guild's chapel at St. Botolph's a popular centre of pilgrimage. In 1533 the Guild produced an inventory which is now on display in the Guildhall that gives a vivid and detailed picture of its building and furnishings. The inventory included a list of the contents of the 'Chantry House', which provided accommodation for the Guild chaplains. Despite the religious significance the sin of gluttony would be very evident as the guildsmen feasted to bursting point on cooked meats of all varieties - boar, swan and peacock among them. To celebrate the Corpus Christi feast in 1515 The Guild of St Mary, not to be outdone by the other Boston guilds, spent £20 on the meal - around £20,000 in today's value. The dining table in the banqueting hall at the Guildhall would have been full of food, ale and wine. On the menu was swan, turkey, bustard, pheasant pie, stews, pig, quail and sweet treats such as jellies and sugared fruits. Water was too dangerous to drink for fear of infevtion and so ale and wine were quaffed in quantity. Great attention to presentation would be paid with feathers being reapplied to cooked fowl to make it look alive and animals being served whole, head still intact, with steam or smoke issuing from the nostrils. These feast days, dedicated to the saints, were events of debauched excess. But it was okay, as the wealthy guildsmen had done the Christian thing and cleared their consciences by supplying bread and potted meats for the paupers' much less lavish day of special prayers and piety at St Botolph's Church. Christmas Eve was the feast day of St John, held to commemorate his blessing of wine, and a main attraction was the meal of wild boar. The Whitsuntide feast held by the Guild of St Mary in the 1390s included such delicacies as lark pie and fallow deer. The Guildhall, after 1545, soon established as the centre of civic life in Boston and remained so until relatively recent times. In fact, every mayor of the town was elected in the building from Nicholas Robinson (or Robertson), who resigned as warden of St. Mary's Guild to take up the post in 1545, through to William Weightman in 1887. 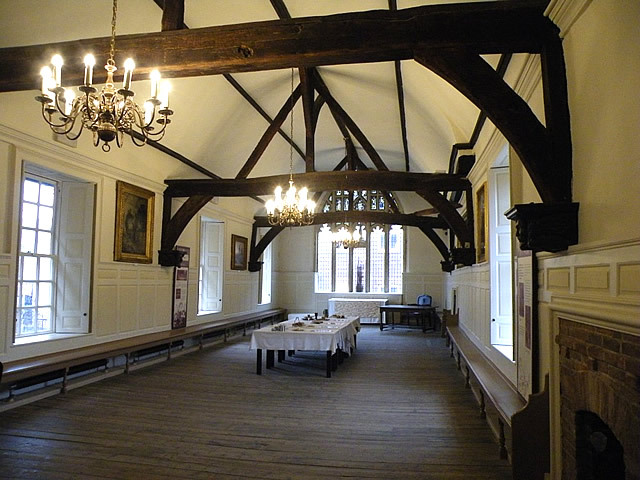 There are references from the 1660s to show that the Guildhall was used for May Day dinners and, on one occasion at least, for the mayor elect to entertain. Turtle soup and swan were on the menu for the May Day civic dinner in 1723. The Guildhall did not have its own kitchens until Tudor times, so food would be brought in ready cooked, possibly from the kitchens of the next door friary. It was hot, hard work in the kitchens - considered too arduous for women or children - where one of the worst jobs was hand turning the roasting spit, or "broche". Meals were meat based - roasted, boiled, fried and stewed - and diners certainly did not get their five a day. In Georgian times vegetables only appeared on the plate as a garnish. One particularly interesting mayor during this period was Atherton Hough, who was elected in 1628 and was also a church warden. It was he who, in this very Puritan town, damaged the statue of St. Botolph, which still stands on a pinnacle on the parish church tower, because he believed it looked like the pope! In the autumn of 1607 a group of men, women and children met a boat on the edge of The Wash at Scotia Creek, Fishtoft, near Boston. They had walked 60 miles from Scrooby, near Gainsborough, to meet a sea captain to travel across the North Sea to Holland where they hoped to live in religious freedom away from the authority of the English Church. Once on board officers seized the group, informed by the sea captain who had betrayed them, and they stood accused of leaving the country without the King's permission. They were taken onto open boats whilst their possessions were ransacked. These open boats brought the Pilgrim Fathers into Boston and they were brought before the magistrates in the Guildhall, which was not only used as a place of assembly for public business but also for the Quarter Sessions for the Borough. The members of the group were led by William Brewster but an account from William Bradford, a member of the group who went on to serve as the Governor of Plymouth Colony almost every year between 1621 and 1656, states the Separatists were treated tolerably well in the town in which there were many Puritan sympathisers including some among its leading citizens. The Pilgrim Fathers were eventually discharged and they were returned to their homes in Nottinghamshire and North Lincolnshire. They later succeeded in reaching Holland the following year by another route and later sailed from Plymouth in the Mayflower for the New World in 1620. Towards the end of the First World War the Corporation, aided by Government funding, established a National Kitchen in the Guildhall. During 1918 and 1919 free meals were provided for the needy and supplies of milk were given in many cases to expectant and nursing mothers. Evidently the Guildhall was considered a suitable venue for eating in as in 1918 a Lieutenant-Colonel Borrell even requested that it be used also for messing his troops. His request, though, was curtly rejected by the Council and he was told that "there were several other large buildings in the town that might be available.....". During the Second World War the Guildhall was used as a British Restaurant, managed by Miss Nora Carter, offered nourishing three course lunchtime fare and regularly attracted between 200 and 400 people in a session. On one occasion it even apparently fed 1,000 soldiers who suddenly descended on it. The meals were prepared in the kitchen, with the dining rooms on the upper floor. Today, a selection of the objects and works of art are on display in the Guildhall at any one time, with the remainder of the collections being stored and accessible by arrangement. The collection includes some interesting items, including paintings by W.B. Thomas and S.G. Enderby and a portrait of Sir Joseph Banks during his time as Boston Town Clerk, a copy of Foxe's 'Book of Martyrs' and artefacts from various archaeological excavations. Text panels, touch screen interactives, a film and audio in the Banqueting Hall and Kitchen enhance the visitors experience and the objects and art work on display. Trails, colouring pages, brass rubbing, sand pit boxes with archaeological finds and a dressing up box are also available for visitors to explore. The main entrance and reception area is situated on the ground floor with step free, level access, throughout. Full access to the showcases and around the ground floor spaces to wheelchair users is available throughout. The lift can hold 4 people and is operated by holding the selected floor button in whilst using the lift. The upper floors are level with floorboards throughout. There is one unisex accessible toilet locatable on the ground floor. The light, easy opening door opens into the gallery space to give maximum access to the toilet area. There are two vertical rails either side of the basin There is a fixed rail to the wall by the toilet horizontally and one rail which can be dropped down horizontal to the toilet on the other side. The toilet is low with a wide handle lever to flush. Assistance dogs are welcome.